Well, as you can see there, it's not all handmade, but a good proportion was. Including these socks which Ryan loves. I've been hesitant to make him socks when he goes through them almost instantaneously, but it was time. This yarn is a mill end from Blue Moon Fiber Arts and the only problem with it was all the slubs and knots. Usually the mill ends are not bad at all. He's been wearing them constantly! Chloe got a lot of little presents (delivered by train) including a couple of Doctor Who inspired necklaces given to her from her grandparents and made by an Etsy seller (The Clay Pony). Chloe, Ryan and I also got hand knit socks made by my sister! That was a surprise. Chloe is wearing hers in the above picture. The other two are below. Chloe's hand carved Santa tradition continues with this addition to the collection. I was so excited. I really didn't expect her to make another one! In the above photo, the three in the front are made by Chloe over the years and the Santa on skis is made by my dad. It was an even greater surprise to find out that she made hand carved Santas for both my sister and my mom too! They had been talking about how much they loved mine at dinner, so it was quite funny when they opened their very own! Chloe also made this great calendar for my dad. She photoshopped him in with some of his favorite scientists like Albert Einstein and Stephen Hawking and added quotes. Dad really liked it! Even though we couldn't spend Christmas with my brother's family, we were together in spirit. I got this ring engraved with Chloe and Ryan's names. Chloe got a pair of beautiful handmade earrings. My secret presents included, for my brother and his wife, the last Project Improv quilt- ta da! I always struggle with finding an interesting machine quilting pattern. I like this one though, which I just did on the fly. These two little Christmas snugglies for my nieces will hopefully be well used over the years. It's always great fun to see all the secret projects that crafty people have been making in the months leading up to Christmas. I hope you've enjoyed mine! Now I have a totally free week and plan to spend it catching up on sleep, reading, and, what else- knitting, quilting and spinning! Cheers! Chloe knitted this blanket for Scrabble with leftover yarns and no planning. She just created squares and rectangles as she went along and sewed them together. She tried out her first cables and decided she likes doing moss stitch! One of Chloe's adorable embroidered owls. She sells her ornaments in her Inky Paws shop. Chloe carved me another Santa! I love this one so much. It's really tiny- less than 2" tall. As you can see, Chloe is all about the detail. Chloe made Ryan a new Ryan's Taco Truck story. In addition to writing and illustrating the story, she made an audio version for his iPod. Ryan made this sweet little pot for me. It's such a treat to get something handmade from him since I know he isn't such a crafty guy. Chloe made this octopus for herself in just a few days. It's made with some leftover Noro Silk Garden. She made up the pattern as she went along. As you can probably guess, she doesn't like to follow patterns! By the way, a squid is in the offing too. More Silk Garden in the form of mitts. Chloe asked me to make these so I designed them on the fly while we were on our trip. The second Noro Silk Garden Stripes Scarf. I gathered some leftover bits of Noro as we headed out the door and put this together on our trip. Kitty Christmas made for my sister and her husband for Christmas. It's hand quilted. And finally, just for Tonya. Some beautiful Christmas chocolates seen in downtown Portland. I've added a few things to my Etsy shop just in time for the holidays! I have made a few new little mini quilts just for fun. Chloe also has been getting some sales in her shop (way more than me actually!). That's Sunshine Coins, above. 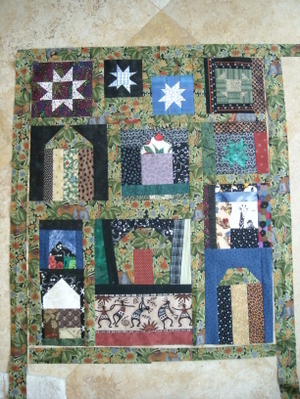 All of these are small enough to be dolly quilts, table toppers or small wall hangings. Raspberry Jam above, and you may remember Bohemian Blue from a few months ago. Christmas is really getting going here and we've been enjoying fabulous weather for the activities. This weekend it will finally get cold and we'll see our first significant snow. Folks around here take their snow very seriously and it just wouldn't be Christmas without it. Photos of holiday cheer next time! Chloe and I have joined the ranks of the Etsy sellers. 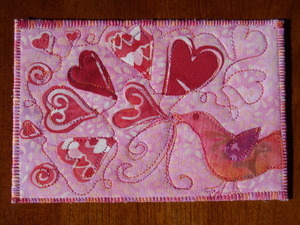 Chloe has already sold several items and I just listed some fabric postcards and a couple of mini quilts. It's exciting and terrifying all at once (kind of like a roller coaster ride!). You can see our shops here at Inky Paws and Knit One Quilt Too. I have the "Night at the Improv" top almost complete. I am adding these narrow borders and I think I'll do something wider as well. I have a super secret project going for someone's birthday so will have to put away the crumb blocks for a bit.